Life without Mayo? Pish- utter blasphemy if you ask me. When made with organic, pastured eggs, and fresh, organic ingredients, mayo can and should be a regular guest in your kitchen. Homemade mayo will elevate even the most basic of sandwiches and will delight your senses and excite your mouth. In short, you need to make this. It’s much easier than you think, and learning some basic emulsion making techniques will take you far in the kitchen. It will also come in handy when I start working more French recipes into this blog. Before I get into everything mayonnaisey I have to thank 7-year old Noah A., for coming up with the fantastic title for this blog post. My creative juices are a little dehydrated so I took to Facebook and asked my clever, loyal readers for help. Both Noah, and his sister, Hannah, came up with great ideas, but in the end, my love of all things Star Wars won out. Thank you, Noah! You really helped me out and I appreciate that. One of the first things we learned to do in culinary school was make mayonnaise. Once you make your own, you’ll never go back to store bought again. Ever. There is no comparison. Homemade looks, tastes and smells better. Also, it’s healthier. Yes that’s right. Healthier. Why? Well, because it doesn’t have any fake ingredients and it’s void of any GMOs. Store bought mayo has always tasted synthetic and chemically to me. 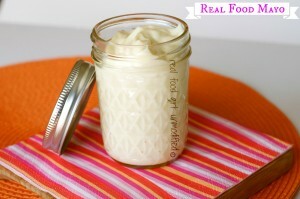 Homemade mayo is heavenly. It’s smooth, creamy, has a little zip to it from the lemon. Mmm, seriously folks. It’s fabulous. When making mayo from scratch I suggest doing it the old fashioned way the first 3 or 4 times until you get a *feel* for how it comes together. Once you’ve done it that way, feel free to branch out into using an immersion blender or a regular blender. I’ve found I can make 1 batch of mayonnaise by hand faster with a whisk and a bowl than I can using my blender, and I make less of a mess, have fewer dishes to make and I don’t run the risk of breaking the mayo (where the fat and liquid separate and it looks like a watery, curdled, gross mess), if I do it by hand vs. using a tool where heat is generated through the blades. There are other benefits besides fewer dishes and less mess to clean up when doing it by hand you know. The other benefits are stronger arm muscles, and if you center yourself properly over your bowl and hold your stomach in slightly, you can exercise and strengthen your core muscles while whisking away. 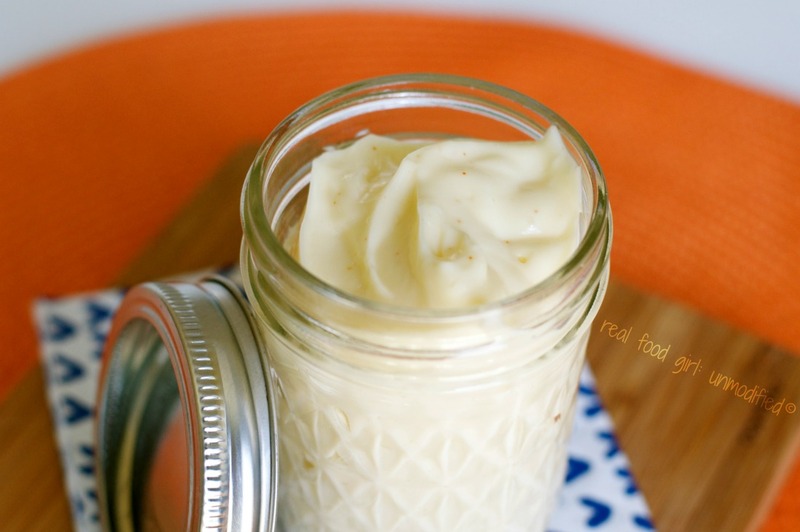 Feel free to skip your visit to the gym on the days you make homemade mayo. It’s strength training and cardio all in one. Trust me. Since falling down the Rabbit Hole that is Real Food, I’ve struggled with finding an oil that I like when making my mayo. We’ve gone through so many that I finally caved last week and bought a jug of some organic brand that I personally think tastes like Miracle Whip, which is an abomination to taste buds everywhere, but TSM (The Stud Muffin) likes it, so it’ll do while I continue to experiential with the best fat to use to make my mayo. NOTE* The oils that you can use are as follows: (make sure they are organic and expeller pressed is best. It’s also good if they don’t do any deodorizing of the oils, either) Safflower, Sunflower, Organic Expeller Pressed Coconut oil (must be blended with another oil, such as safflower to keep it from solidifying when it reaches temps cooler than 76 degrees) Olive oil (not extra virgin–it’s too pungent and it also ceases to be mayonnaise when you use olive oil. It’s technically an Aioli), and finally Sesame oil and *Ghee (clarified butter) . I warn you, sesame oil has a very distinct, nutty flavor and I don’t care for it in a mayo. You can also used clarified butter (*Ghee) but then we’re technically making a cold béarnaise sauce, not mayo. I still prefer any type of organic vegetable or canola oil for taste, but I can’t seem to find an oil that doesn’t taste rancid, so I continue to experiment as budget allows–this doesn’t mean I’m using the organic vegetable or canola oils, I’m just stating what I prefer taste-wise and how I’ve not been able to find any oil that come close to what my homemade mayo tasted like before we switched to real food. I make a double batch of mayo every 10 days or so. On days when I make my Curry-Cayenne Chicken Salad, or my Tuna Salad, or even potato salad, I will obviously triple the batch. You’ll want to have some of this on hand because I have a few recipes that I’ll be sharing within the next couple of weeks that call for mayonnaise and they turn out much better when you use homemade. Are you ready? Take a deep breathe, focus, clear your mind, do or do not. There is no try. And above all else, patience you must have my young padawan mayo makers. Patience! 1 heaping tsp. of good Dijon Mustard–Don’t laugh, but I don’t care for Dijon, so I use only about 1/2 tsp. Put egg yolk into a medium sized bow. Add 1/4 tsp. salt, the Dijon mustard and 1 tsp. (to start) lemon juice. Whisk for about 2 minutes. The goal is to get some volume out of the egg yolk, to prepare it to accept the oil. Also, you want the color of your mixture to become lighter- kind of lemony colored. Start by adding the oil a couple of drops at a time, while whisking constantly. This can be a bit tricky, so add a few drops using a spoon if needed, then whisk for 15-30 seconds until the mixture forms an emulsion (i.e., thickens), and add a few more drops of oil, and whisk again for 15-30 seconds, lather, rinse repeat. Kidding, just repeat the adding a few drops of oil and whisking. After about 1/4 cup of the oil has been added, whisk your emulsion for about 60 seconds. Taste it. It should be well seasoned. At this point add another 1/2 teaspoon of lemon juice or vinegar- depending on what you used and whisk for another 30 seconds or so. After whisking to incorporate the lemon juice/vinegar you’ve just added you may start adding it at a little faster rate. I hold my cup up high and drizzle a VERY FINE stream of oil into the bowl AS I’m whisking CONSTANTLY. If the oil starts to pool I stop drizzling, and just whisk my mixture for a little bit. It should start be starting to thicken up a bit by now, and it should also start to “jiggle” a bit when you stop whisking. To test this “grab” some of the mayo with the whisk, and shake the whisk- if it jiggles, you know you’re on the right path. Continue to drizzle in the oil, a little at a time, while whisking as continuously as you can. If it starts to get too thick, either add more lemon juice or vinegar, or water- A FEW drops at a time to your taste. Homemade mayo has a little more zip to it than Kraft “Mayo”… But the flavor is out of this world. Just keep whisking in the oil until there isn’t any oil left to whisk in. Taste, and adjust the salt level if needed and add the cayenne- whisk it another 60 seconds, and then store in the fridge for up to 2 weeks MAX. The mayo will have a little more color to it than the bleached-white stuff that you get at the store. Hardware Needed: 1 glass bowl, 1 balloon whisk, 1 kitchen towel rolled into a circle to anchor your bowl/hold it steady, 1 spoon, 1 measuring cup. Just tried this. It is delicious. I made it, worked beautifully and tasted great using grapeseed oil! I might try safflower or sunflower next time, though, and test them. Now on to making my Pasta Salad!! So happy to hear this!! 🙂 I’m glad you enjoyed the recipe. I found your site accidentally, as I was searching for a pasta salad recipe using ‘real food’, and what a happy accident it was! I’m a foodie-turned-real foodie just the last year or so, and find that taste and texture are sometimes compromised in ‘real food’ recipes. So, thank you for this blog! I’m excited to find other yummy recipes here! By the way, speaking of oils for mayo, have you tried grapeseed oil? It is nearly as flavorless as canola and is more healthful. The last couple of months I’ve been experimenting making mayo, and have realized that the finished mayo is almost like an oil magnifier! It amplifies the oil taste, and it’s been frustrating, and pricey to find a neutral tasting oil that isn’t rancid. I really appreciate this ‘whisking’ recipe and will be trying it out today, as I have some beautiful organic cherry tomatoes that need some pasta and mayo for a home! Have you tried using Rice Bran Oil?? It is a new oil on the scene in the health food world. Or maybe it is just new to me, but it is a good Non-GMO option. Your recipe stated 1 “pastured” egg yolk. Did you mean pasteurized or from a free range chicken? And if pasteurized, how do you do that? Thanks! I mean from a chicken that was allowed to roam freely in open pastures. Free-range holds about as much water as “all natural” does. I get my eggs from a local farmer through our co op. Hope this helps. You’ve made the process way less scary than I thought it’d be. Thank you! You bet! It’s really not that bad. My instructions are wordy intentionally so that you have a greater chance of success the first time around. Enjoy it! You can’t use a food processor. The heat from the blades will destroy the emulsion leaving you with a curdled watery mess. My method is doing it by hand. It takes roughly 5-7 minutes. 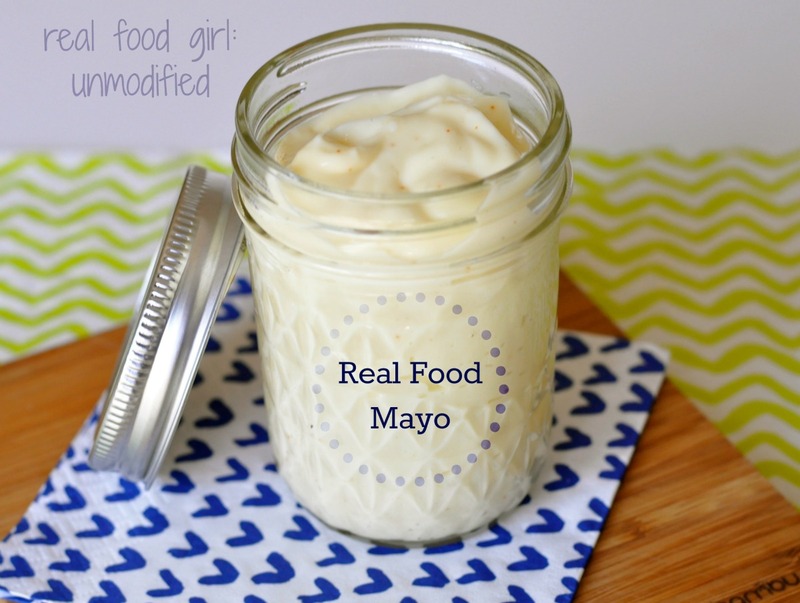 Love your posts, and what you stand for:) Love mayo recipies because homemade is so much healthier…however, I’ve read that Canola oil is quite bad for you. 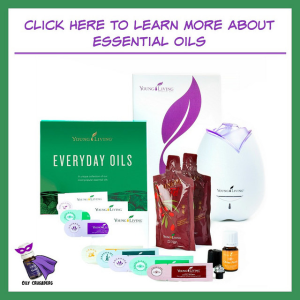 Whole 9 Foods is a great resource to check out about oils. Currently, the only ones we use are coconut(for cooking) and EVOO for dressings/cold dishes. I’m curious what you think! Hi Paige, Thanks for the compliments and for commenting. It’s personally been a real struggle to find an oil that doesn’t mess with the way mayo should taste- granted that’s just based on the integrity of my overly opinionated taste buds. Knowing that canola oil is starting to get bad press is also another reason why I listed multiple types of oils. Because everyone has different tastes I wanted to list as many fats/oils as possible in this recipe to give people multiple options based on where they are in their Real Food Journey. I also read that there are cold expeller pressed organic oils which do not use heat or deodorizers and there are sites like WebMD who state canola oil isn’t bad and it isn’t from the Rapeseed like many of the blogs talking about the evils of canola are saying. I guess what I’m trying to say is that I will be doing more research. I do not cook with canola. IF I use it at all- I use it when I make mayonnaise and only if another option isn’t readily available. I’ll let you know what I find out when I have had a chance to do more research. I’ll then update the post as needed. Hi Rachel, add the cayenne in step 7 right towards the end once you are satisfied with the flavor and the salt level. When do you add the cayenne?